Imagine you are model pilot and for a perfect start of your model aircraft you need the actual weather conditions, especially the speed and direction of the wind. So you can reduce the risk to crash at the start and you can decide for the ideal orientation into the wind for a take off. There are anemometers like in figure 1 which give an indication about the windspeed and by turning it manually, the direction can roughly estimated. But this gives just a snippet of the actual conditions. A more robust and reliable system would be preferable. 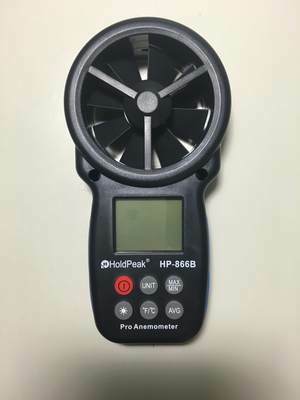 Other devices on the market like vane style anemometer, see figure 2, or ultrasonic anemometers can be used to determine the speed and direction more precisely. But those systems have some disadvantages. They are quite expensive compared to the handheld anemometer and they are bulkier. 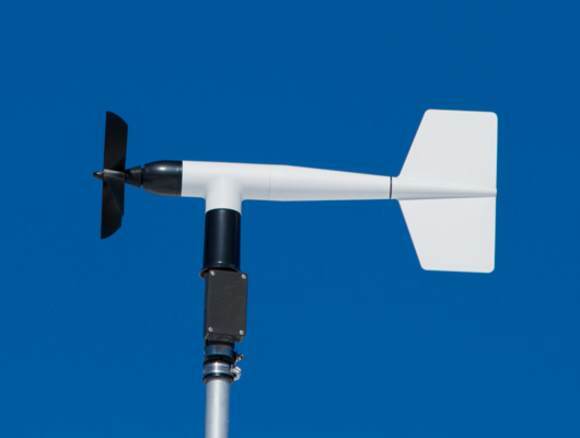 An alternative, which is comparable in size and prize to handheld wind meters is needed. 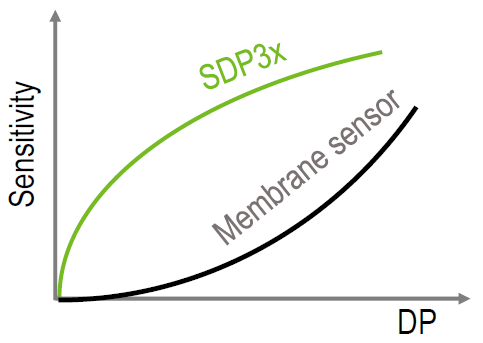 As already known from Pitot tube applications, a differential pressure sensor like the SDP3x can be used to measure wind speed. 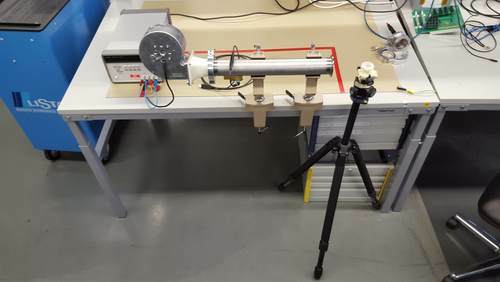 Compared to other measurement principles like membranes this has the advantage that the sensitivity is higher at lower speed and thus is very accurate at small wind speeds. 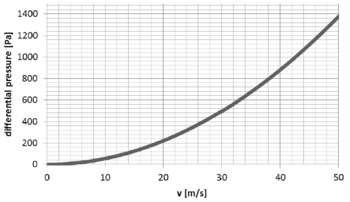 The measurement principle is quite simple, see figure 3 for details. In a tube with two openings, one opening faces towards the wind and sees the total pressure, the other opening sees the static pressure of the ambient (yellow marking in the picture). If the wind now blows into the front opening, a differential pressure (DP) is generated proportional to the velocity (Pt - Ps). This has to be scaled by the density of air rho. This leads to the final formula v^2 = 2*(Pt - Ps)/rho. 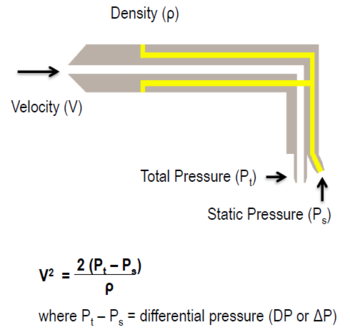 The relation of differential pressure versus velocity is shown in figure 5. A single pitot tube measures only the wind speed from one direction. 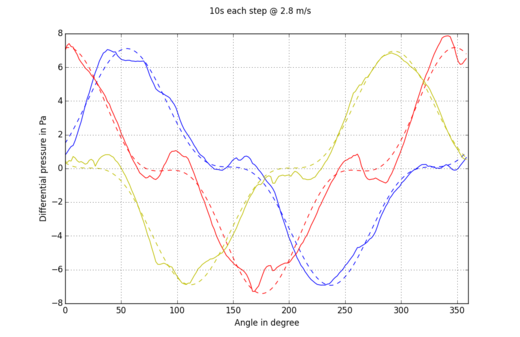 To get an angle of attack, it is necessary to combine two sensors or more to an array. whereas ρ(p0,T0 ) is the air density (1.1289 kg/m^3) at calibration pressure p0 (966 mbar) and calibration temperature T0 (298.15 K), while ρ is the current absolute air pressure (e.g. measured with a barometric absolute pressure sensor) and T the current differential pressure sensor temperature. 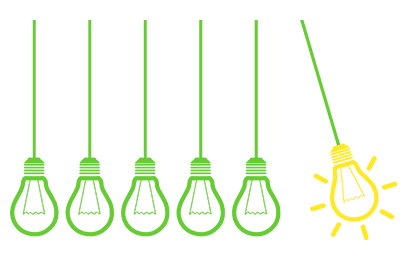 whereas ρsealevel is the air density at sea level in the International Standard Atmosphere (1.225 kg/m^3), ρ0 is the calibration pressure (966 mbar), while ρ is the current absolute air pressure (e.g. 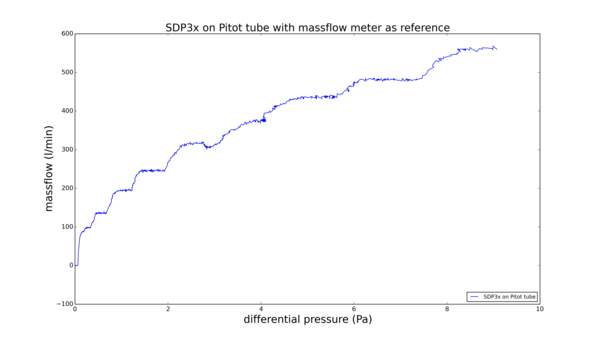 measured with a barometric absolute pressure sensor) and dp_sensor is the output of Sensirion’s SDP3x sensor. 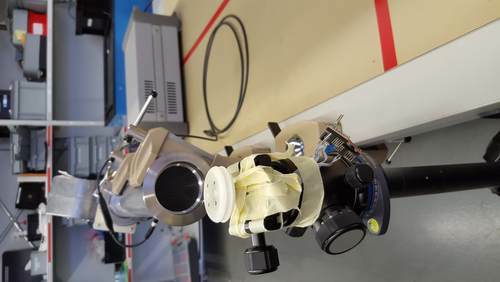 To get the wind speed and the specific direction at least two sensors are needed, placed orthogonal to each other. 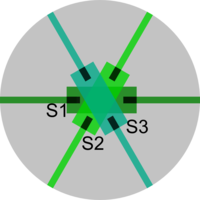 To get a better resolution, we decided to use three SDP3x sensors (S1, S2, S3) with a 60° rotation llike shown in figure 6. For those sensors a PCB was made, on which the sensors were mounted. 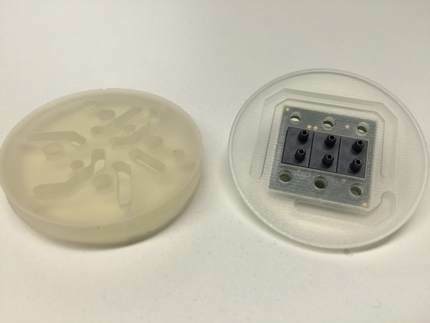 The mechanical part is made of 3D printed material. A picture of the setup is shown in figure 7. 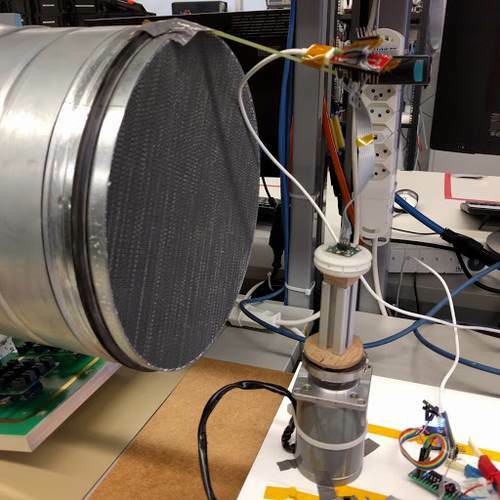 The device was tested while mounted on a step motor in front of a self built wind channel with reference sensor. As shown in figure 8, the result looks similar to the theoretical graph in figure 5. An overview of different set-ups used for reference measuring the system can be found in figures 9a to 9c. The measuring results are shown in the following plots figure 10a with a wind speed of 2.8 m/s and figure 10b with a wind speed of 7.8 m/s. 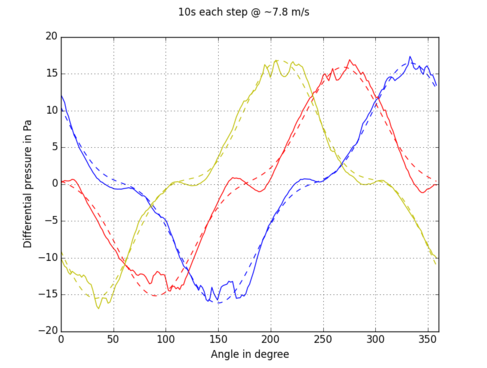 The lines show each of the three SDP sensors. The dotted lines are the fit of a sinusoidal function.